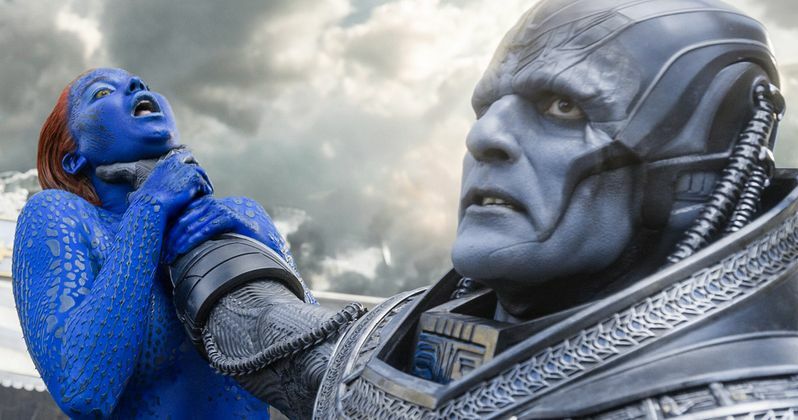 Oscar Isaac reveals that working on Brian Singer's X-Men: Apocalypse was "excruciating." The movie did well at the box office, making $543.9 million globally against a budget of $178 million, but it wasn't received very well by critics and fans. It's the fourth highest grossing installment in the X-Men franchise and has been criticized for being lopsided, repetitive, and redundant. As it turns out, it wasn't a very fun project to work on for Isaac, who portrayed the villainous ancient mutant En Sabah Nur. When he said yes to taking on a role in X-Men: Apocalypse, Oscar Isaac did so because he wanted to work with the talented cast of actors. The cast includes James McAvoy, Michael Fassbender, and Jennifer Lawrence along with many others. However, Isaac had a hard time interacting with anybody due to the large amounts of makeup and huge suit that he had to wear. He explains. "Apocalypse, that was excruciating. I didn't know when I said yes that that was what was going to be happening. That I was going to be encased in glue, latex, and a 40-pound suit, that I had to wear a cooling mechanism at all times. I couldn't move my head, ever." Since Oscar Isaac wasn't very comfortable in his giant suit, he'd basically just try and sit as still as possible. "So I just wouldn't ever talk to anybody," says Isaac. Plus, he had to wear what he calls "high heels inside of a boot," which added to the discomfort. He had this to say about working on X-Men: Apocalypse. "I couldn't move my head. And I had to sit on a specially designed saddle, because that's the only thing I could really sit on, and I would be rolled into a cooling tent in-between takes... and I was just gonna be sitting and I couldn't really move, and like, sweating inside the mask and the helmet. And then getting it off was the worst part, because they just had to kind of scrape it off for hours and hours. So, that was X-Men: Apocalypse." Oscar Isaac went on to say that his gigantic uncomfortable suit that he wore in X-Men: Apocalypse also made a ton of noise when he moved. All of his lines had to be dubbed in during the post-production process since his suit was too noisy. Overall, it really sounds like working on the movie was a giant hassle for the actor, who has since gotten to play some characters that require much less makeup. Jennifer Lawrence had a pretty similar experience to Oscar Isaac while portraying Mystique in four X-Men movies. Lawrence had her whole body covered in paint, which was hard to get off at the end of the day and she always wondered if it was safe to breathe in. Obviously, the studio wasn't going to let the actress walk around with toxic body paint all day, but it still doesn't sound like a lot of fun. You can check out the interview with Oscar Isaac and his X-Men: Apocalypse experience below, thanks to the GQ YouTube channel.